We have developed the tonearm »10.0« and the cartridge »Pi« as a completion for our two direct drive turntables »Oasis« and »Bardo«. The »10.0« has a close resemblance with the »10.5« tonearm. Various component parts that have proved to be perfect in our tonearms like the arm tube with the special hard ceramic surface, the headshell, the tonearm lift and also the mounting socket are also used for the »10.0« tonearm. Therefore the »10.0« can be mounted on tonearm bases with the same drillings as the »10.5« or »12.1«. The »10.0« uses a different bearing technique than the »10.5«, it is a kind of unipivoted design. We use a miniature bearing mounted on a stainless steel tip for the horizontal mounting. 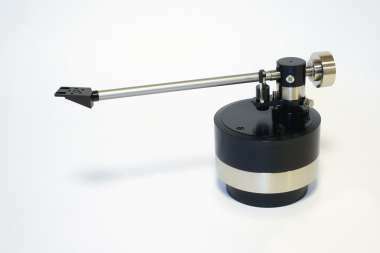 A ceramic bearing at the bottom prevents the sideways motions of the tonearm. This bearing is friction free and allows a very smooth play. Unlike a magnetic or hydraulic damping, this solution creates a lively and also stable soundstage. The same miniature bearings are used for the vertical movement in a play free adjustment. The sound performance of our new tonearm 9.6 reaches our established tonearms well; of course it is a first match for most different cartridges. The »10.0« features an infinitely variable Azimuth adjustment. A small clamping screw from under the arm tube holds the headshell in position. The headshell can be rotated by about ± 5° after untightening this screw. A precision-made plastic part mounted instead of the cartridge allows for aligning the headshell parallel to the platter or record surface. This plastic part has the same height like our EMT-ti cartridge and allows additionally for alignment of the arm height. If a cartridge has some deviation in azimuth, adjustment can be done by rotating the headshell in the desired direction to set the stylus of your cartridge vertical to the record surface.